Aww! I love your sweet witch girl and her little pumpkin! Hope your kids get to enjoy Halloween candies and dressing up! Hi lovely Witch! Cheer up Lia, and take a day off and do what you like to do! Aww aww .. sooo cute!! love your Halloween bento!!! You're right! It's almost Halloween...:)! 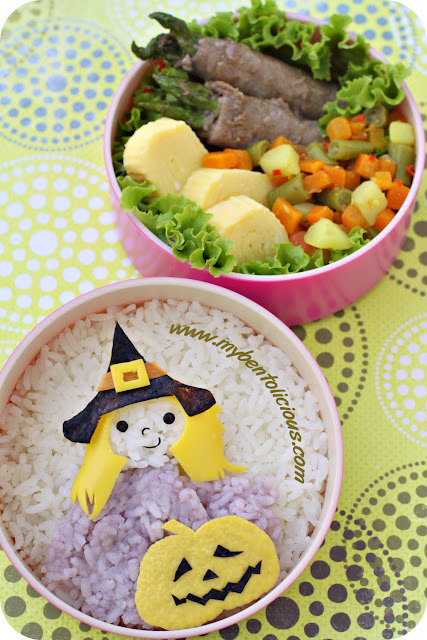 I've got to find some ideas to make Halloween-themed bento, this will be my first one :). Your little witch looks adorable and your tamagoyaki as always is flawless...!! I still need to learn how to make better tamagoyaki from you :). I love it Lia! Your little witch looks so welcoming and friendly. Sorry you are feeling down in the dumps right now. Remember about the smiles you are are making with your lovely bento all around the world! @Lina Gladman : Thanks a lot Lina! @Cooking Gallery : Thanks a lot Sin! I'm sure you will have no problem with tamagoyaki and Halloween theme bento ... boo!! I love the witch girl and the pumpkin, they look so cute! That is adorable! I love how you made the witch! @Heather : Thanks a lot Heather for your kind comment!